Small/Medium/Large, with Headgear (1st Generation Flexifit) - SHIPS FREE! Large, with Headgear and Soft Foam Cushion - SHIPS FREE! Medium, with Headgear and Soft Foam Cushion - SHIPS FREE! Small, with Headgear and Soft Foam Cushion - SHIPS FREE! X-Large, with Headgear and Soft Foam Cushion - SHIPS FREE! 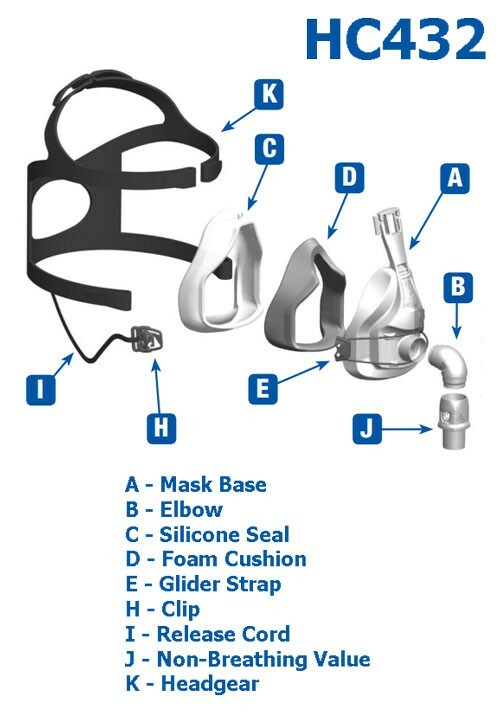 FlexiFit CPAP Full Face Mask has several unique features that provide a breakthrough in comfort and flexibility for CPAP Therapy. FlexiFit Full Face Masks have an Under-Chin Design that provides a better fit and better seal. 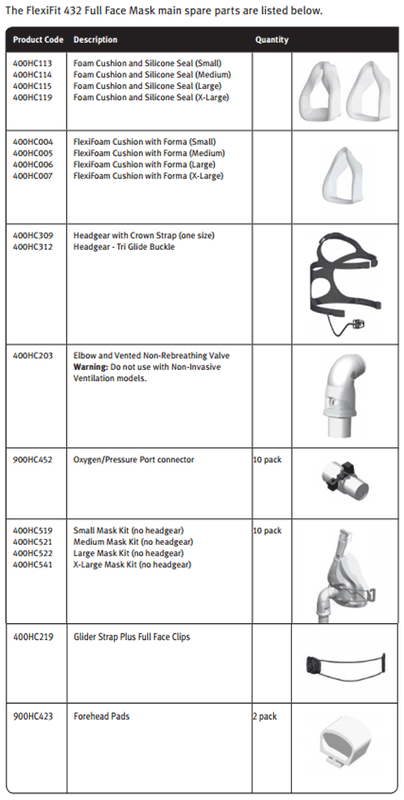 FlexiFit Full Face Masks are manufactured by Fisher & Paykel and offer superior technology for a highly effective CPAP Full Face Mask that is easy to use. The FlexiFit Full Face Mask comes assembled with FlexiFit technology to accommodate a wider range of face shapes. Equipped with a front rotating swivel allows a wider range movement and a unique Glider Strap creates stability without restricting head movement. 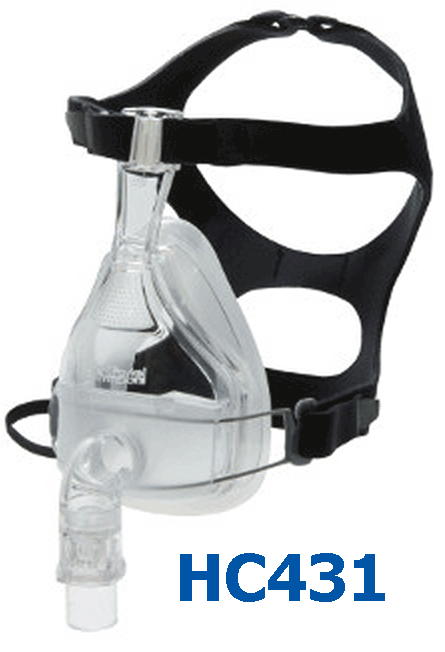 This CPAP Mask also features BREATH-O-PRENE headgear which is cool, lightweight and comfortable. The FlexiFit Full Face Mask employs an easy to use Fit and Forget technology. The FlexiFit Full Face Mask is available in two separate versions. The first version is the 1st Generation FlexiFit Full Face Mask or FlexiFit 431. 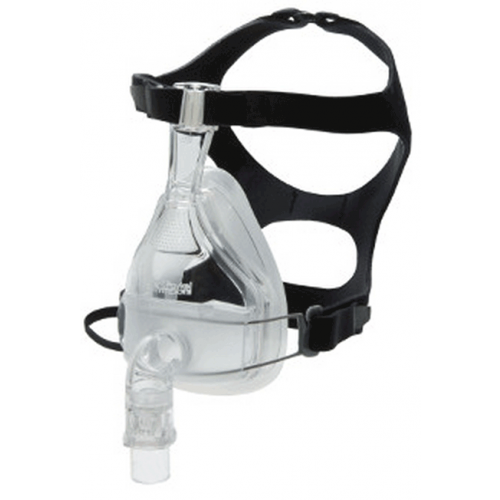 The other version is the 2nd Generation FlexiFit Full Face Mask or FlexiFit 432. The FlexiFit 431 comes with a small, medium and large silicone seal for fitting to individual needs. Each of these seals are supplied with the mask purchase. The FlexiFit 432 however, comes in three separate options--small, medium or large full face masks. The First Generation FlexiFit has less parts and comes with everything needed to fit almost any face. The Second Generation FlexiFit comes with soft foam cushions that fit under the contoured silicone seal for a soft and comfortable seal. Medium Silicone Seal, 400HC104 (standard size silicone seal). 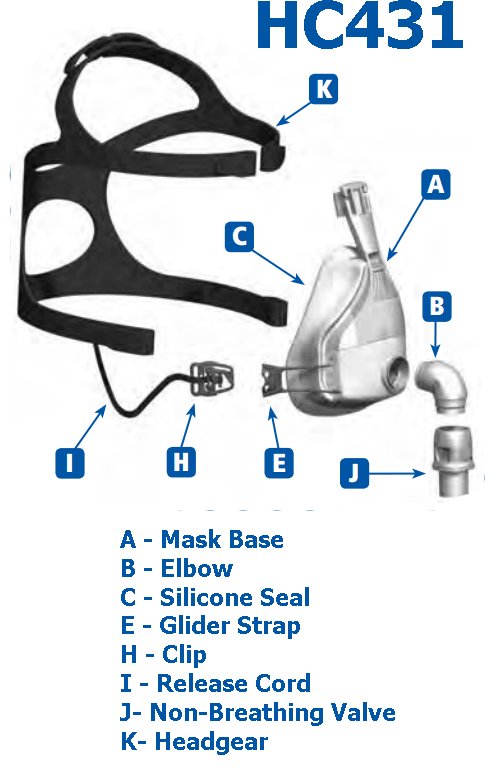 Elbow & Non-ReBreathing Valve, 400HC203. 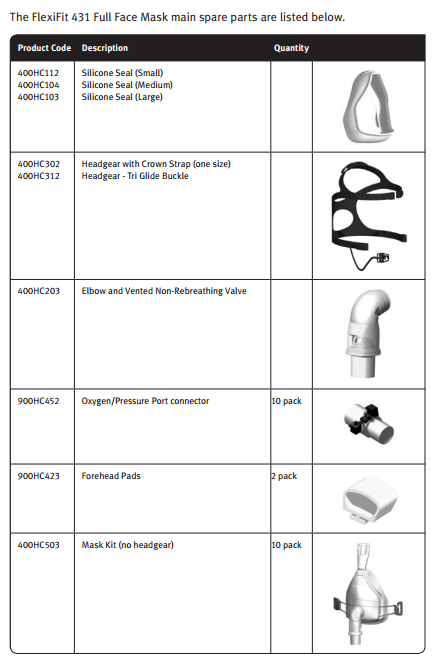 Headgear with Crown Strap, 400HC302 (one size fits all). Glider Strap and Tri Glide Buckle, 400HC312..
Headgear with Release Cord and Clip (one size fits all). Bias Flow Diffuser Cap plus Spare. Bias Flow Diffuser Material plus 6 Spares. With Foam or Air Cushion FlexiFit Technology automatically adjusts to a wide range of nasal and facial contours with simple one-step ease of fitting and no complicated adjustments. Crown strap and under-chin design provide extra stability and a secure fit. 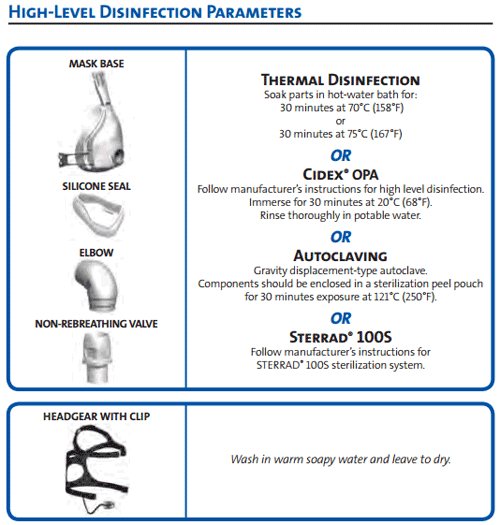 Fit and forget headgear does not require ongoing adjustments to maintain fit and seal. FlexiFit 431 is a fully assembled mask with all three sizes of silicone seals included in box to meet the needs of individual patients. 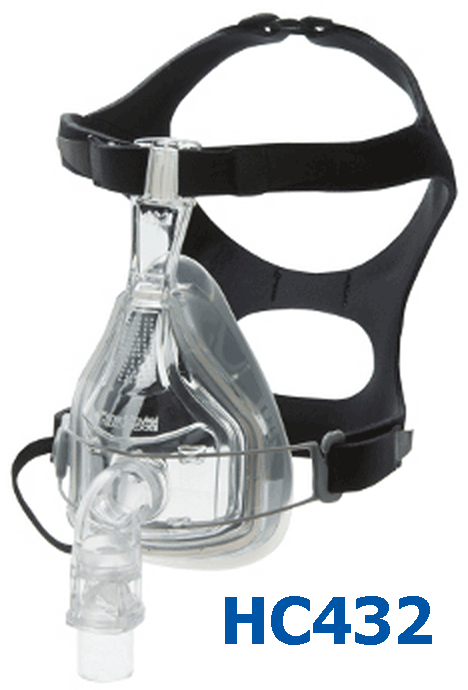 FlexiFit 432 is a fully assembled mask available in Small, Medium, Large, and X-Large. FlexiFit 431: Pressure drop through mask @ 50 LPM 0.2 +/- 0.1 cmH2O; @ 100 LPM 0.6 +/- 0.1 cmH2O. FlexiFit 432: Pressure drop through mask @ 50 LPM 0.3 +/- 0.1 cmH2O; @ 100 LPM 1.3 +/- 0.1 cmH2O. FlexiFit HC431: 1.3 cmH2O with Non-Rebreathing Valve. FlexiFit HC432: 1.3 cmH2O with Non-Rebreathing Valve. FlexiFit HC431: 2.9 cmH2O with Non-Rebreathing Valve. FlexiFit HC432: 2.5 cmH2O with Non-Rebreathing Valve. Sound Power Level: 30 dBA, with uncertainty 2.5 dBA. Manufacturer: Fisher & Pakel (F&P). This is the best mask I have found in over ten years of using CPAP. Fit is fully adjustable. The fact that components are available solves one of my biggest gripes with masks that must be thrown away when only one part is worn out. I have been suffering from severe sleep apnea for 4 years now. I am glad that my doctor found this very effective CPAP mask for me. Now, I get a full night sleep without getting a bad headache in the morning. The mask stays on my face the whole night. These masks are also very economical.